A blog that's mostly OSR rpg, presented one bullet point at a time. Do you know how to illustrate a cosmic force without using squiggly lines? Because I don't. So I've read this interesting take on divination on Mastered by Marquis's blog and decided to mash it together with my alignment system. Rules wise this doesn't change anything, but justifies how Mancy works. Mancy is the practice that allows you to talk with the Power you're aligned to and ask it questions(in my last post I called them "Alignments" but "Powers" makes more sense after someone else used it). Since Powers usually "thinks" in favor of those it is aligned with, the Power will freely give answers to the person. The problem is that elemental forces and abstract ideals are not people and do not "think" like people, so there is a significant barrier in communication between the two. Vague and cryptic prophesy is the result of translation error, where either the Power poorly understood the question or misinterpreted how much the diviner understood. The diviner gets worse results the more they divine in a single day, ironically, because they start thinking more in tune with their Power. If a part of you're mind is thinking in Ocean or Law, it isn't able to think in person and the information more difficult to use, even if part of your brain understands it better. It's nothing a good night's sleep can't fix thought. Be warned if you start using it excessively (by divining 6 or more times each day for a while) you can permanently gain decreased maximum result. Now you may be wondering, if mancy allows you to ask informative questions of things greater than man, than can it be used to ask a Power to do something? I don't see a reason why not, I'd say the rules are the same as for gathering information but the Divination Die is ruled on this table instead, and it counts as a preformed mancy. 1: The Power interprets you're request in the worst way possible. Everyone at the table is free to suggest what could go wrong and the terriblest result happens. 2-3: The Power misinterprets what you wanted to happen and it goes bad. 4: The Power doesn't understand what your request, so just ignores it. Nothing happens. 5: The Power misunderstands what you want, and does something fairly harmless instead. It's obviously supernatural and NPCs will react accordingly thought. 6: The Power does exactly what you told it to do. This only has a risk of monkey-pawing you if you are hurrying. 7+: The Power does exactly what you want it to do, with no if, or buts. Asking a Power to do something is generally a very bad idea, so most sensible diviners will go out of their way to avoid doing so. When they do request the great powers the results are always memorable, so people assume that's what diviners do all the time. Necromancers as respectablish profession for contacting those who have pasted away. The necromancer is able to contact the dead thought the medium of their Power, "inside" of which the spirits of people end up. Wizards Know Something You Don't. 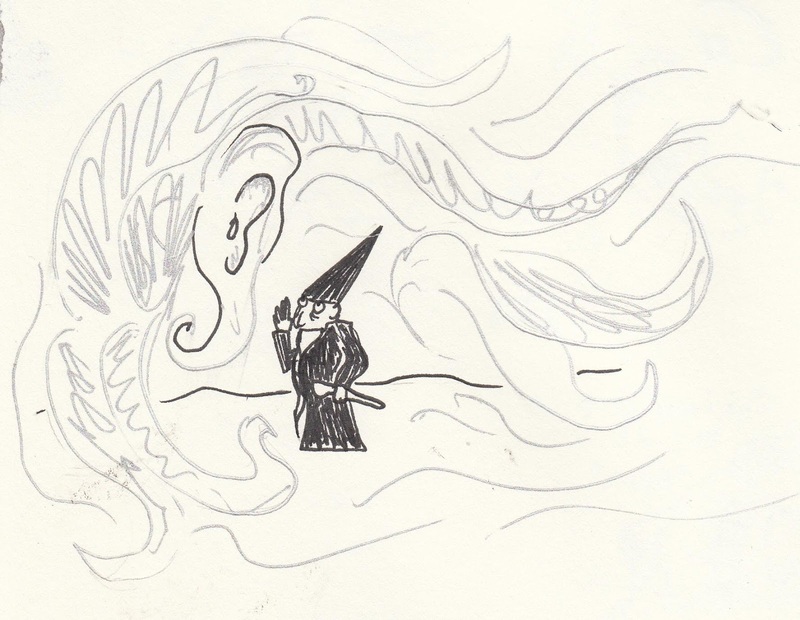 Wizards don't understand nearly as much as they'd like you to believe. They will be blindsided by both their personal biases and the bias of the Power they consult. There is good reason to be weary about attacking the court magician even if they just lounge around all day and look at the stars periodically. Ambitious magic users scheme about many things. A few famous oracles are no longer people, just vessels that spout prophesy and the thoughts of great alien minds. People bind minor imps to act as pocket sized diviners, this results in predictions that are both more understandable and less accurate. As a GM roll a d6 behind a screen. The lower the more the imp twists the truth to their advantage. Someone who divines with cards could be aligned with the Game, or with something else, as the major arcana are based around astrology. You can figure this out by how the person talks about their prediction. e.g. If they use words like "piece" or "move" when referring to you're future, they are likely Game aligned. Mystic hobos that know everything that can appear anywhere in the city. As I'm a Pratchett fan I want to make rules that encourage Granny Weatherwax play. Which entails having magical powers and not using them. Having magical powers and not using them doesn't sound that fun thought, so I wrote explicit magical powers to be highly risky. You'd ask the a Power of something if either you have a clever plan that you've carefully laid out (and would you look at that, the normal use of mancy is an information gathering tool, a helpful thing for forming clever plans), which is the kind of combat-as-war play that the OSR is based around, or as a Hail-Mary when cornered. Because seeing you're wizard get exploded from tampering with powers beyond his control is it's own reward, and if that wizard does somehow make it out alive, than it's surprising. This is intended to exist along side Arcanum as a more flexible but less reliable power. Arnold's Orcs in this system always hate their aligned Power. They curse it and spit at it for what it, an orc who doesn't hate the Power is not really an orc. (the exception is Family, but that is hidden by the much louder other Power) Sky is popular because that's where the gods are. The Show is also popular because that's what the gods make of their lives. War is also a good bet when it comes to orcs. It may not seem like it, but orcs hate War, there are not enought words to describe how much they hate it. Void monks practice the Mancy of Nothing. Speaking with Nothing never gets you any information, however if you do it enough than you you're mind will be eroded away, which is the point for void monks. People try to align with Everything, and become one with the universe. The Mancy of Everything is about as useful as the Mancy of Nothing, but for precisely the opposite reason. When connecting to Everything there is to much information for a brain to make any use of. It also take a lot more time to do than mancy usually does. A character who's becoming one with the universe can't be adventuring at the same time. A person's alignment grows and changes with them as a person. Often rapidly as a child and more slowly with adults. When a child is in the womb they are first aligned to their Mom, who greater beyond comprehension at this stage. Than when they are born and start learning about the world, it expands from Mom to Family and/or Home and spirals out in any number of directions from there. Usually children pick up their parent's alignment along with all the beliefs and values that a family instills in them. Teenage rebellion often relates to a change in view on an aligned Power rather than a change to a different force. Sea and Ocean would be the same Power viewed from slightly different angles as they refer to the same thing. Same with the Show or the Spectacle or the Play, it's all related to the central concept of viewing the world through the lens of performance. I think it's fine to refer to the same Power by multiple names, as many of these concepts are to large to be contained within a single name. There are some places where you could argue either way if something is the same Power. For example, Mountain and Earth can be considered the same. Both relate to stone and both are things dwarves would be aligned to. However, on the other hand by associating the two, you're associating surface dwelling mountain goats with underground creatures like the horrible things in the Underdark. It all depends on what feels right to you and you're players. Another example is that I won't align all the fish in the sea with the Sea, because, everyone who lives on land isn't aligned with it either. However you could rule it either way. In my mind there are several ways you could organize the Powers in a setting. Either have a fluid and disorganized mess of various concepts and (super/un-)natural forces like I've been describing in the two posts on the topic, or you could have a carefully structured set of Powers. Something like MtG Colors or Homestuck Aspects, or even D&D's alignment chart that I dread so much. Both of the former tie concepts with physical things and would give the world an distinctive flare than if a confusing hodge-podge is used, but also doesn't allow alignment to be as personally significant for almost all characters. I am not yet sold on either direction for this, and in retrospect I definitely had Aspects in the back of my head when writing the original post.